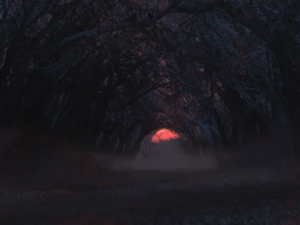 For my Halloween wallpaper this year I set out to create a creepier version of "Elegy" and mix in elements from "Forest of the Shades" and "Dark Wings". The title also refers back to one of my first Halloween wallpapers. I may still render another version of this one (the thumbnail looks a bit too dark to me) but I think it looks spooky enough to share as is. Check out the rest of my Halloween wallpapers here. Love this picture. The setting sun in the background is great. It's funny that you made this image when you did. A couple of weeks ago, I was thinking of the scene from Beauty and the Beast where Belle's father was going through the dark forest. I wanted an image like that as my background and then this showed up! The stars are aligned! Ok, seeing as how I love all your work, not even gonna bother trying to pick out a favorite. I like the no sleepwalkers version, but it would be cool if the birds' eyes were just as bright. Also, just re-reading The Hobbit, the scene makes me think of Mirkwood. "RE: A version with out the walkers?" Ryan - See I told ya this scene totally could stand alone. It's a nice eerie fall scene. Just scrolled down and saw Rob's comment. Definitely agree with the AWESOME! of the zombies popping in and out. Just wanted to add that I'm on a Mac . . . so if folks want to try the effect they know it works on Macs too. Without them, the scenery is nice, but there's no focus to the image. I love the scenery but it's going to be the zombie-less one for me....and thats because the original gives me the major creeps!! "Like the Alt version better"
Love it with the zombies but I would like them to look a little scarier. Maybe red or white eyes ? If only between these two I prefer the one without Zombies, but would like one with Zombies if they were reworked. I am one of those that asked for this alternative version and I love it! Thanks, Ryan, for listening and delivering! Use both... with Windows you can have the backgrounds scroll every now and then, set it to alternate with only these two backgrounds so you have on-off zombie images flickering over time... AWESOME!! I, like others, really appreciate when you create an alternate render of a specialty/holiday wallpaper. Like you said, it allows for non-halloween purposes! I love this one both ways. Not a fan of halloween, as such (not a holiday in my country). So I much prefer the no-walker wallpaper. Thanks for catering to those that want the alternative. The scenery in it is just epic. Creepily awesome. There's a bit of smoke around of late, so I've seen sunsets reminiscent of this. Very cool. Epic win. I'm not a huge zombie fan, but I think the one with the walkers in it is better as a "Halloween" wallpaper. However the one that will be cycling in my wallpapers folder will be the non-walker one. Just great scenery. Love it. Very nice, not sure if there's a version with zombies with red eyes or maybe no glowing eyes on the way? I prefer the sleepwalkerless adaptation, myself. Looks great. Zombies make the scene. Keep nosleepwalkers in the pickle jar. dunno what I was thinking--"nosleepwalkers" is good--but the original is better!!! Very nice... Almost as if the zombies were invading Canopy Creek. This is perfect for the season, the zombies are small and do not detract from the scene at all in my opinion. I say keep them! 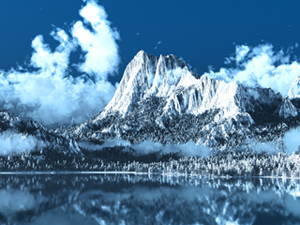 I am curious about the filtering or is it a volumetric effect that makes the larger triple screen wallpapers look slightly over bright on the edges or "washed out?" Something I have been wondering for a while. "Sleepwalkers -- Happy Halloween 2012 (Halloween)"
It looks really good. I don't know if the glowing eyes really suit the zombies. I really like the mood of it though. Good job! Totally sick.. love the psycho sun behind them..
Small bloop: on the 3840 x 1080 (dual 16:9) your watermark is in the middle of the second screen. Thank you for getting the multiscreen posted! 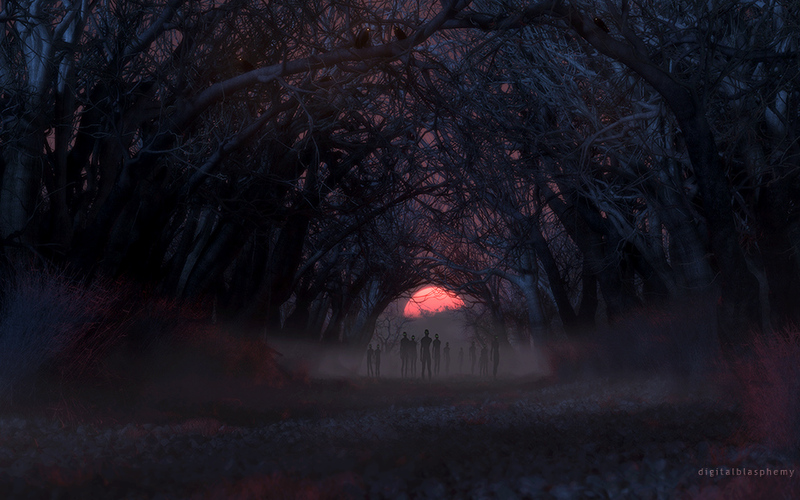 I dig the trees, the fog, the birds and the setting sun...but the sleepwalkers just don't feel right in this one. I'd love to see a version without them. And more crows! I dig the crows! @Ryan, you say NONE of them are missing arms??? Even if they were not facing forward most people would expect to see the other arm (at least part of it) since they are not moving and very skinny wastes... I think it's cool for some to have arms hacked off like the one in the front (looks like the right side is a stump to me). Might even be nice to mix in one or two with both arms missing. And I love the crows in the trees. Your Halloween pictures are always awesome! It just looks great; from the gnarled, twisted trees to the inky red sun setting beyond the mysterious figures. I noticed some small white dots in the upper branches. At first I wasn't sure whether there are crows around the dots, meaning they would be their eyes, or if they're just some pixel errors. When I set the screen brightness to a maximum, I could make out the shapes of birds, but I think a bright screen takes away the creepy atmosphere of the wallpaper. Thus, I think the birds' eyes are too distracting as they are. Maybe a more orange-like color as in "Dark Wings (2009)"? "A version with out the walkers?" I like the scenery of this piece a lot...I think it could stand well on it's own with out the walkers. Its the same human model turned all different directions. They all have one arm. The moon is nice but overall the wallpaper is really bad. Its not creepy but just plain sad. If you added the green eyes to make it creepier that failed too. 90% of the population is Right Handed so if they were hacking at the zombies with machetes or axes, or whatever they could find, they would hit the L side of the zombie 90% of the time... So THAT is why most of the zombies are missing their Left Arms. Just in time for Season 3 of The Walking Dead! The only thing I would change is to maybe make a few more zombie models to have a little more diversity in how they look. Otherwise I like it, but come Halloween, I'll always switch to "All Hallows Eve" that is by far the greatest & Creepiest Halloween Image ever. Very spooky, but definitely works for Halloween. The fog / mist adds incredible detail, and I love the ravens in the treetops. zombies. i flippin' hate zombies. Appropriatly creepy. Awesome background for Halloween. I think the quality of this is higher than Forest of the Shades, I think they have dissimilar intents, this one is certainly more overt. Hard to say one is better than the other. I do like this quite a bit, as I do all your work. It almost has a Tarentino quality to it. "Yeah, we're coming for you..." Very nice work. Look forward to the multi-screen setups. None of them are missing arms but some are turned away. Would bats flying around be too much? Nice maybe make the bushes on each side more liquid like they have heavy dew on them. These are fun and do like it. Thanks! Nice wallpaper. One question, why are the left arms missing on most of the zombies? Erm, hopefully the multiscreen is finished soon! (Missed a word) A way to delete comments would be nice.. haha. This wallpaper is awesome! Hopefully the multiscreen is finished so I can use it before Halloween! I too would also like a version simply without them, by itself, I think the tree tunnel is stunning! Maybe so. I've found that the best wallpapers have elements that catch the eye from across the room yet also reward close inspection. The difficulty lies in balancing the two. The forest and the sun are great, but I think the walkers are too obvious and set-apart to be really creepy. In that respect "Forest of the Shades" was a much stronger piece. I would love to see a version of this sans walkers. Very well done, nice use of color and contrast. It kind of amazes me how so many of your pieces come out so well; you have a real eye for well made art. Amazing! I love all of your Halloween themed wallpapers!